Noida's Aqua Line Metro trial run started from Sector-83 Metro station to Metro depot located in Greater Noida from Wednesday. 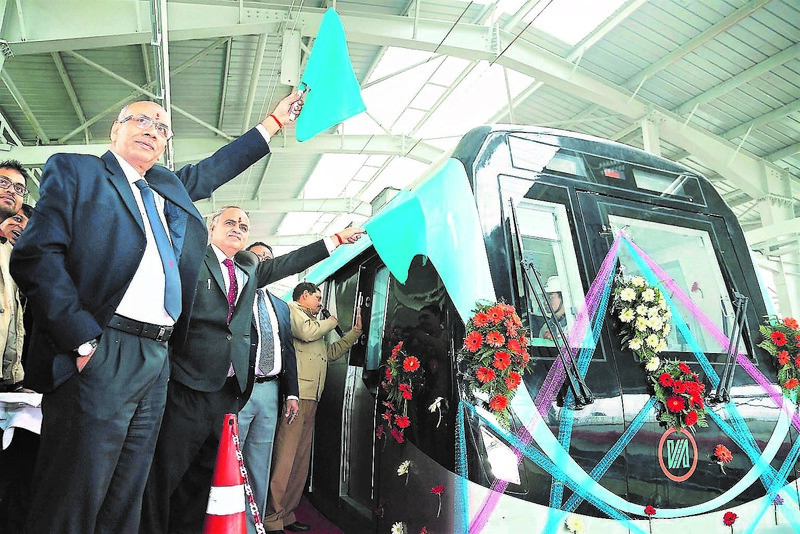 Noida: Noida-Greater Noida’s Aqua Line Metro for Noida Sector-83 had a trial run on Tuesday for the first time. It’s trial run started from Sector-83 Metro station to Metro depot located in Greater Noida from Wednesday. During this time the metro will cover a total of 23 Kms. A total length of track of Aqua Line Metro is 29.707 km. Metro trial will be started on the entire track till next month. Speed test is also to be done in the Metro trial. This will be done under the leadership of the test research design and standard organization. After this, permission from Metro Rail Safety Commissioner (CMRS) will be allowed. Noida to Greater Noida Metro Route is to be operated by December 2018. Signal system has been completed up to Sector-83 stations on the track. The Aqua Line Metro, which will be operated from Sector-83, it will be officially operated from the Sector-83 Metro station from Wednesday to the depot. This operation has to be done for about a month. Metro on Tuesday reached the Aqua line at the station located at Sector-83 its trial will begin on Wednesday. In this way, several technical aspects were examined before the trial before metro speed, time to arrive at the station, track status. During the trial, the speed of the Metro will be examined by Research Design and Standards Organization (RDSO). The track has to be operated at a speed of about 80-kilo meters per hour. In such a situation, special attention will be given to speed according to time its intensity will be examined. The Metro will go from Sector-149, 153, 147, 144, 143, 142, 137, 85 and 83 to Greater Noida Depot. After one month, there will be a trial on Dadri Road and its stations. After the trial, the Metro will be started after getting approval from the Metro Rail Safety Commissioner. Civil work on PD Upadhyay (Executive Director, NMRC) Metro route has been completed. The work of its bio duct is also completed. From today Sector-83 will be on trial. After this, there will be a further trial. Kanika Verma is working with Metro Rail News as Media Intern and She is currently pursuing Bachelor in Journalism & Mass Communication (BJMC) from Fairfield Institute of Management & Technology affiliated to Guru Govind Singh Indraprastha University, New Delhi. The article is written by well versed person with very good English. It was reviewed by head of editor before publishing, so please once again go through it.